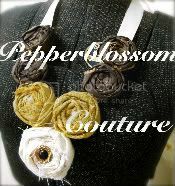 pepperblossom decor: Be a part of Our Give-A-WaY! enter to win our pepperblossom decor giveaway by simply signing up to Follow Us. sign up to follow us and see if your name is drawn to win an Oh so Cute prize! you only have until mid Sept to enter, so don't delay - sign up today!